Over the channel today to start. Weather turned foul of course. Hey! Here we go on our European Theater adventure! Hehe, three Yanks and one Canadian took off from Cranfield UK. (EGTC) and headed to Jersey, UK.(EGJJ). Hehe, I'll bet our German friends are really worried about that! (old joke). We kind of had a rocky start, and this joker forgot to send a complete AI to the rest of the flight members, but took care of it today. One neat thing about the flight after we took off, was that we could fly low across the Channel and sneak up to Jersey and land without any problems with the exception of the bloody weather. Had to catch up with guys at Jersey as I got a bit behind. See, I was up at the Cantina in Rochford, enjoying some pints with a Royal Navy Chief and we got into a little bet. Somehow I ended the new owner of a Seafire III. It looks like it's having a bit of an identity crisis at the moment and the RN Chief did mention that I should probably get out of Britain with it pretty quickly. So, I had to take the long way around to catch up with the guys in Jersey. Hey, we took off from Jersey (LGJJ) headed across the pond towards France and the plan is to land at St Pierre d' Oleron (LFDP) and being a short runway and being grass should be no problems for these birds. It was noted the we would be passing two of the biggest submarines pens that were built in WWll, one is at St.Nazaire and the other one is at La Rochelle. Shucks, we even flew over one of Airbus's plants. Old Dudley and I dropped down a few hundred of feet and flew along the tree tops and flying the mossie at these heights was a kick in the back side, fun, fun. hehe. So we are having one day of R&R here at St Pierre d' Oleron , don't ask me to pronounce it had a heck of a time spelling it, before heading out again. A pitstop into Montlucon to get some new tyres. We did some sightseeing on the way to Brest. Did the MM tours special beach package including Sword, Juno, Omaha and some others. Then to St Michel for some roundy round action. Finally landed at Brest. I'm headed into town to see if that brick oven pizza joint is there that had the cherry beer. Believe or not, we finally got the new engine from the UK and it has taken a few days in install the bugger. Now, we will be doing some test and check-ups on the over all plane before setting off after Flight 19. Hey great news, after the check out on the Mossie which were just fine we took her North up to the Normandy area and fly over the different beach where all hell had broke lose. Like a lot of folks in this country we all had family member and good friends who made the landings. We are not leaving out all of the allied forces who landed there also. Then we flew back towards LFRL hopping to catch up with the team. If the bloody weather holds tonight I should be able to fly tonight. Got a deal on something Teutonic. Now if I can just keep the guys in the British aircraft from getting trigger happy. We flew over Paris last night. I'd have got more pics but had a real life issue pop up that had to be attended to. But I got back in time to land and park. Well the local authorities took issue with that German bird. So I made a few quick calls, caught the red eye up to Merc Air HQ in Rochford and flew the ol' PV-3 back to Criel. Nice flight and got a few pics along the way. Hello, here are some pictures from pervious flights. Oops, two didn't get up loaded. Well heck, here we go again trying to catch up with Flight 19 this is getting a little out of hand. The local powers, Police or what ever, decided that we were smuggling something. Hehe, these boy went thru the Mossie and checked every place where you might hide something. Then those bloody buggers started to go thru the whole routine again, so Dudley and I tried to step away for some coffee, and the biggest and ugliest copper stood in front of us just hopping we would try something, but alas, we just stood staring at this bugger. Well, before we talked to flight 19 for them to continue the plan for the flight to continue on the flight plan, and if we don't land in jail we will catch up as soon as possible. Well the old Boy decided we weren't smuggling anything. Hehe, They blew it we were smuggling the airplane! Now it's time, to get the heck out of Creil and catch up at Mirecourt. Picture climbing out of Creil. We flew on to somewhere's near Lyon France. Great flight in an area with lots of history. Got a in flight closeup of the Ventura's tail.. The flight between LFSG Mirecourt to LFXA Amberieu was just great! A couple of things during our flight was that Ventura finally got the top turret to move around, so being the good guys we radioed Willy to make sure that Fred doesn't get gun happy and by a mistake by popping off a few rounds toward us. hehe. Dudley was sure hopping he would so we could get into a real brawl, But nothing happened. We had some conversations about going over to this here place and have some cheese and a little wine, didn't go over to good with us two Yanks, hehe, beer and pizza was considered instead, but alas, we continued onto Amberieu, just maybe they have a pizza joint, but not holding my breath. Hehe, Oh by the way we all landed safely. Like we say, it was a nice flight between Amberieu LFXA and Targe LFCA. 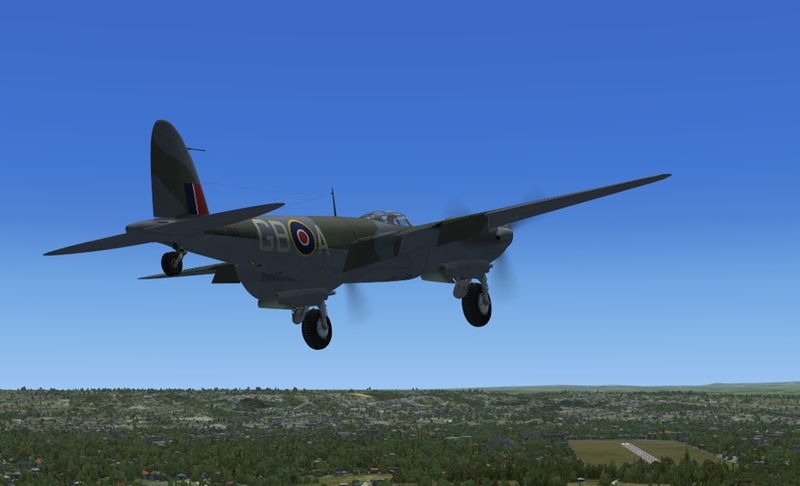 Even with a runway of 2600 ft all made it in, one problem the other Mossie had some problems and return to the airport. No big problem we understand, so he should show up here soon for todays flight. One part of the scenery we passed over there was more lakes or ponds we spotted that are in the State of Minnesota me think. Hehe thinking is a major problem. Darn, we are having a problem in finding a pizza joint, sure would seem like there should be one somewhere on these flight. Must remember, when in Rome do as the Romans do! See you all later. Picture: Three of the flight 19 clowns showing off their birds. Hey! Better late than never. hehe! Here we are all gassed up with fuel for the aircraft, and a few of us also have gas. Son of a Gun, this French food is great and filling, but alas, the after effects are, well, any way you may likely know. lol. Friday we were schedule to fly to Amiens (glisy) LFAY from LFCA Targe, Chatellersult. Amiens we are schedule to lay-over for a couple of days in order to TLC the aircraft and ourselves. It is an interesting flight over France, never realize that how many small villages and farms that here in this part of France. But you learn something new on all of our flights. Next we will be flying into Lelystad, Netherland. Willy wants to divert from our flight plan, and fly over to a city where he lived for sometime. Hehe, Maybe he could show us some interesting places to go, you know like museums, hehe I know you don't believe that! You all take care and we will see you next week. Pictures: The three of us before take off, and one where we parked Amiens. The spit driver took off before me could get the picture. Hey there! After one heck of a week with all the problems we, meaning me and Dudley with the local customs folks. 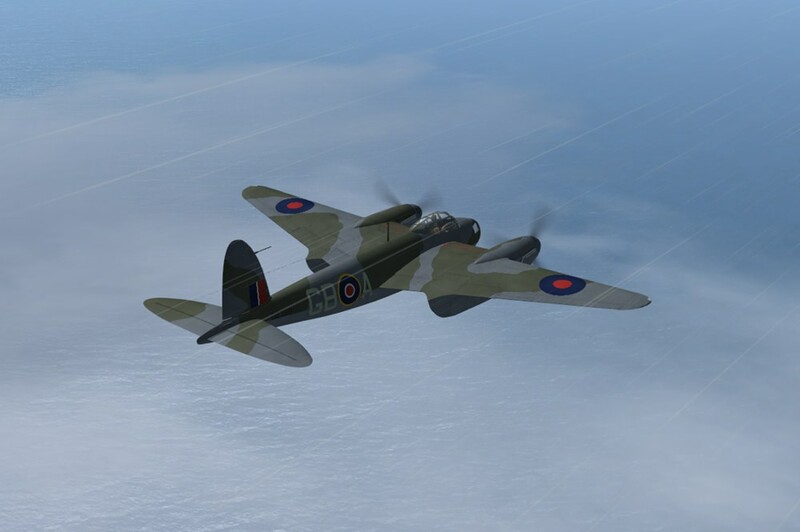 Well, to start, it seem our Mossie wasn't register in some way and it took a week for that and them My passport was in questions, but alas, that was straighten out. How I have no Idea. Will be taking off shortly in order to catch up with the CNs of Flight 19 at EDKH KIEL, GR. We sure are hopping for a better reception at KIEL than the place before. See you all later. 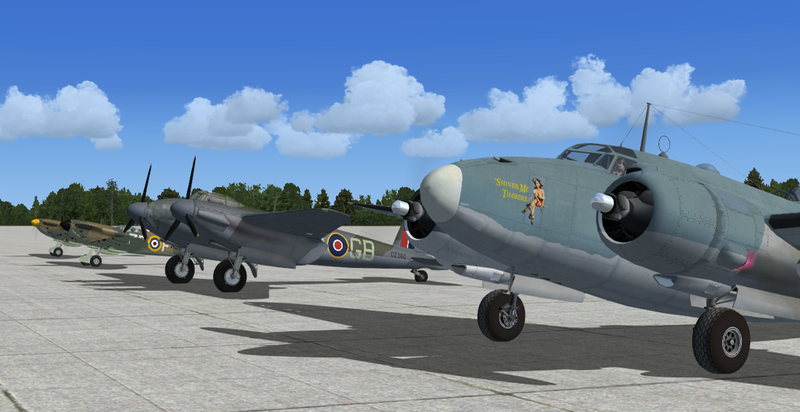 Good day folks, Heck, I caught up with Flight 19 at Kiel and we proceeded onto EDAV, Finow, Gr. I think somewhere along the line of flight we passed and airfield where, as I understand it, all of the German aircrafts were tested and assuming pilots were also trained. I wasn't, as usual, paying much attention to the conversation at that time, hehe was to busy looking at the scenery. All in all it was a nice flight, but at times we had some screwy weather, but being Flight 19 that is not uncommon. Today is a R&R day for resting checking out the local pubs and eateries. Tomorrow, we will be off to Berlin me think. But again not paying attention. hehe. Night All. Hello all! It was sure a very nice flight from EDAV Finow, Gr. to LKLT Letnany to Czech Republic via a side trip to Berlin, Gr. to buzz the city and fly over the Brandenburg Gate. It took me a little while to make the trip thru Berlin just sight-seeing a wee bit. For a big change no problems with the local custom folks they were more interested in all the British Aircraft and the jokers flying them. Now the next flight will be back to Germany and land at an Air force base. Boy, the name has a lot of letters and please don't ask me to try and say it, hehe . Furstenfeldbruck! now my friends that is some name. We flew into Manston yesterday for a change of aircraft and to dash back across the channel. After a few rounds at the base Pub, I flew on to Merc Air HQ in Rochford to pick up something suitable out of the hangers there. 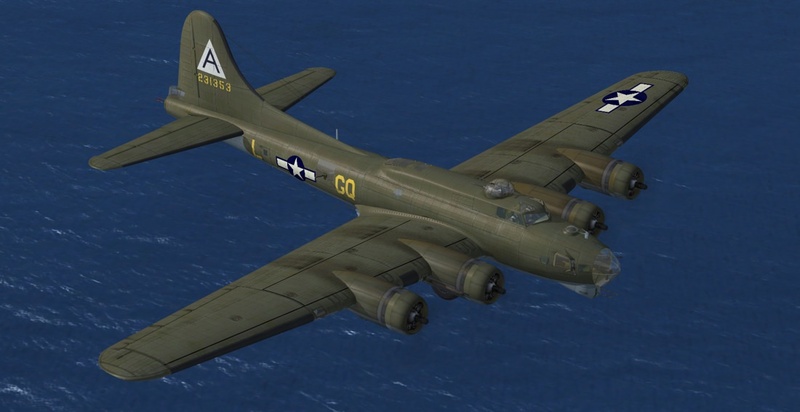 Picked up this ol' B-17 and then got ready for the short hop back to Manston. I was having an issue with the Flyin' Fort as it had been so long since I'd last flown it and I think the manual "flew out the window" during the flight over from the states a few years ago. Had to find a new parking spot once I was on the ground. Now to figure out where the rest of Flight 19 is hanging out at. I'm starting to understand why it was named "Fireball" As soon as I started the engines, it had a couple of engine fires.